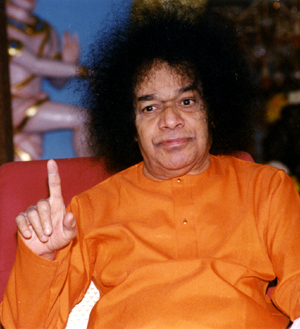 Christmas discourses of Bhagawan over the years have been occasions for great revelations on Jesus Christ. He has recounted various facets from the divine life story of Jesus which were hitherto unknown. Here we have one such discourse where He narrated some salient features of Jesus’ personality and then went on to materialise a Unique Book during His discourse in 1996. Read on to enjoy this wonderful discourse! “As the name and fame of Jesus spread, opposition to him developed among a section of Jews. After his father's death, young Jesus considered it his duty to help his mother and revere her as divine. Jesus preached the primary obligation of everyone to show one's gratitude to the parents. Jesus came with his mother to Jerusalem when he was eleven years old. His mother was worried about the activities of Jesus. Jesus was critical of the ways of the Jews in the temple in Jerusalem . 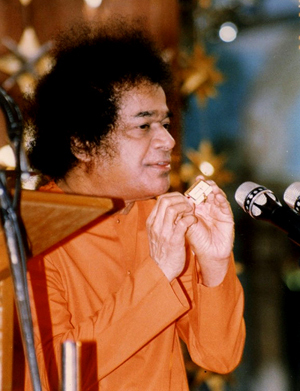 He came out against the harmful practices in the temple and preached the omnipresence of God in all living beings. He exhorted the people not to cause harm to anyone. What he preached was in accord with the basic teachings of all religions. He engaged himself in a mission of mercy to the sick and the poor. He offered food to the hungry. Seeing his acts of love and kindness, people declared that he was a "Messenger of God." Jesus constantly referred to God as the father. Later he declared: "I and my father are one." 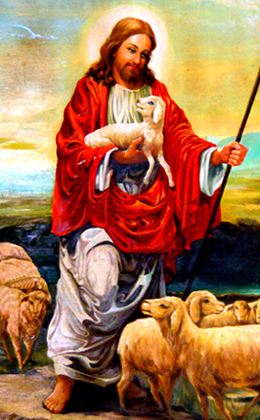 Jesus dedicated his life to the propagation of faith in one God who is common to all mankind. Men today celebrate the birthdays of great holy men but they do not follow the teachings of the masters. There is nothing great about the celebration of birthdays. People must resolve to uphold their ideals and act up to their teachings." "There is a book compiled in Britain around 1530 A.D, containing all the information about Jesus gathered during the preceding centuries. 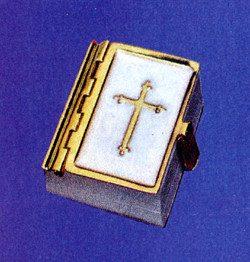 The Russians condensed all this material in a small book which they preserved in a place on the Black Sea coast,“ Swami then produced the little book you see below by a circular wave of His hand and held it before the audience. “This is the book. You can see the cross on the cover page. The book was designed to demonstrate the common features of all religions. What is contained in this book is not to be found even in the Bible. It contains an entirely new account of the life of Jesus. The essence of all creeds is one and the same thing. Man's primary duty is to surrender to God. 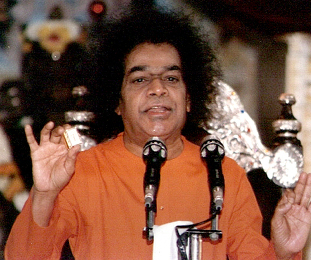 "Surrender" means attaining the state in which the devotee feels he is one with God. This feeling arises out of the conviction that the same divinity is present in all. Bodies of human beings are varied like bulbs, but the current passing through them is the same. The colour of the bulbs or their wattage may vary. But the current activating them is the same. This book contains the Vedic saying: "Ekoham bahushyaam." (meaning, I am The One which becomes many). The same God dwells in all beings. There is no justification for differences on the basis of religion. It is attachment to the body which accounts for religious differences. Do not regard the body as permanent. It is a water bubble. The mind is a mad monkey. Don't follow either of them. Follow the conscience. That is the main message contained in this little book. The culture of India has experienced this truth in the concept of Sath-Chith-Aanandha (Being-Awareness-Bliss). Today people read all kinds of books and go after all sorts of "great persons." They do not enquire about what constitutes greatness. Realise that there is no one greater than each of you. But you have not discovered the real truth about yourself, like an elephant that does not know its own strength. A mahout with a goad is able to control it. Recognise the fact that the whole universe is within you. You have all the powers in you. They are derived from the Divine Spirit within you. It is the Divinity which endows you with a Free Will. Forgetting the supreme power of the Spirit, people place their reliance on the powers of the body, the mind and the intellect. Embodiments of Love! 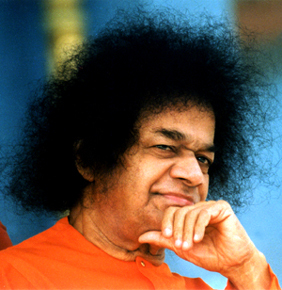 If you want to realise God, if you wish to experience the Divinity within you, if you want to know your true self, you have to develop pure, unsullied love. It is this that binds all people. It is described as the Prema-paasham ( tether of love). Today there are numerous sects within Christianity all of which are engaged in propagating their respective doctrines. While this preaching goes on, there is very little of practice in daily life. Practice is most important. People may be entitled to propagate their creed. But that does not achieve anything lasting. Only practical example matters. When you practise what you preach, others will be inspired by your example. No one will care for the teaching of a person who does not practise what he preaches…. Develop the love of God. All other forms of love are not love at all, but only fleeting and impermanent attachments. Man's biggest folly is forgetting his divinity. All should realise that they come "from God." All are children of God. Everyone should seek to get nearer and nearer to God. That is sadhana (spiritual practice). You must feel that God is Hridhayavaasi (dwells in the heart). You must develop compassion in the heart, because without it the heart is only a stone. That is the message of Jesus - the message of love. Love is God. Live in love. Start the day with love. Spend the day with love. End the day with love. This is the way to God. Only the person who is filled with love will be dear to the Lord. This book contains the declaration: "Yo madhbhakthah.." "The devotee who is filled with love of God is dear to me," says the Lord in the Gita. God is your unfailing friend in weal and woe. You must acquire His friendship. Embodiments of love! There is love in everyone of you. Develop that love. Share it with others. When you have this love there is no need for you to go in search of ashrams. There are some foolish, persons who go on hopping from one ashram to another. This is sheer folly. There is no need to go anywhere. The Divine is in your heart. Adhere to one belief firmly. Do not change your faith from day to day. Follow one path with firm faith. That is the Love principle. - Divine Discourse on Christmas, 1996.